The Ann Arbor campus of the University of Michigan has changed dramatically in the years since the University relocated from its original Detroit location in 1837. This exhibit allows the viewer to select a time period and, from an overview of campus representing how it looked at the time, select individual buildings for more information, including images, concerning the history of the building. This exhibit was first prepared by Bill Landis as an independent study project, investigating a possible use of the World Wide Web by archival and cultural properties repositories. It was created under the aegis of the School of Information and Library Studies at the University of Michigan and with the cooperation of staff at the Bentley Historical Library. The exhibit is now maintained by the Bentley Historical Library. 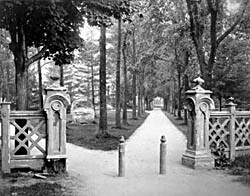 For more history of the University of Michigan and its campus, see the Millennium Project University of Michigan history web portal.